Young art student Hideo (Shûgo Oshinari) paints an unnerving portrait of Tomie (Sakai), who whispers that she loves him. Inexplicably, he reacts by stabbing her to death with a painting trowel. Two friends, Takumi (Tsumabuki) and Shunichi (Kikiwada), arrive on the scene and help him dispose of the body. 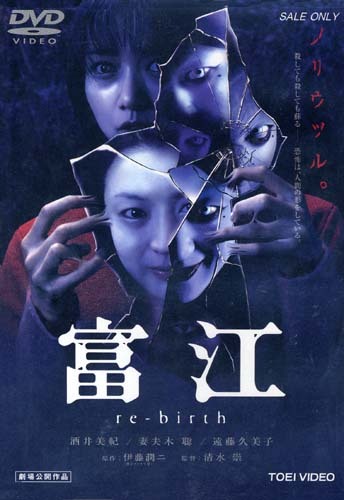 To cheer him up, the boys take the unwitting murderer to the nearest bar for a party... but a mysterious girl named Tomie shows up, bearing a few odd physical resemblances to the dead girl in the ground. Soon Hideo winds up a bloody mess in the bathroom stall, and his two compatriots are assaulted with a series of bizarre events in which Tomie possesses other girls' bodies, winds up a yammering severed head with claw-like arms, and taunts them no matter how often they kill her.